In this post I aim to prove van der Waerden’s theorem on arithmetic progressions. The theorem states that so that if the set is partitioned into classes, one of the classes is guaranteed to contain an arithmetic progression of length . Before proceeding further, lets look at a bit of history regarding this result. As per a recent book the theorem was conjectured independently by the mathematicians Schur and Baudet sometime around the 1920’s. (The exact dates are unknown). In 1926 van der Waerden, then a young scholar in Hamburg, heard of this conjecture (he believed it to be solely by Baudet) and proved it in the course of a remarkable discussion with his teacher Emil Artin and the mathematician Otto Schreier. The beauty of the proof was that it did not use any tools of advanced mathematics and yet was not simple by any means. Khinchin has referred to it as one of the three pearls of number theory. Theorem: so that if is -colored then there is a monochromatic arithmetic progression of length . And now, on to the proof. As a first step towards proving the result we shall first introduce the concept of wheels. The next step will establish some technical lemmas concerning them and after that we will prove the van der Waerden theorem. A wheel of radius , degree and base point or origin is a tuple: of -AP's each of which has base point . The AP's are called the spokes of the wheel. Assuming that all numbers under consideration have been colored a wheel is weakly polychromatic if all of it’s spokes are monochromatic with distinct colors, and strongly polychromatic if it’s spokes and origin are all monochromatic with distinct colors. An example of a strongly polychromatic wheel of degree and radius is given below. In case of a weakly polychromatic wheel the origin, i.e. , can be of any of the colors of the spokes. A translation of a wheel by a number defined as the wheel obtained by adding to each number in . We now move on to the next stage in our proof, where we shall establish some technical lemmas concerning wheels. Lemma 1: If is a wheel of radius and degree and the translations of are all strongly polychromatic with the same colors, then the wheel of radius and degree is weakly polychromatic. Proof: The integers respectively picked from are identical in color because the ith component of each translation is colored identically. So is monochromatically colored and distinct from others. Similarly the AP of the base points also has a distinct color. Thus we have a tuple of AP’s each of which is distinctly monochromatic if we ignore the base point , or that is weakly polychromatic. Lemma 2: If is a weakly polychromatic wheel of radius , then either is strongly polychromatic, or contains a monochromatic AP of length . 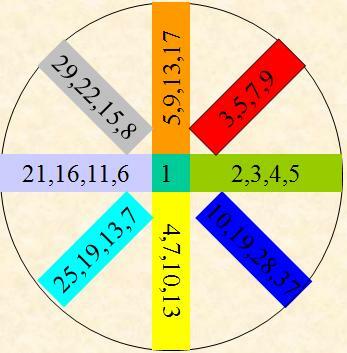 Lemma 3: A strongly polychromatic wheel cannot have degree where is the total number of colors. With the necessary machinery in our arsenal we now attack the van der Waerden theorem proper. Claim: For any such that given any -coloring of , there exists either a monochromatic AP of length , or there exists a strongly polychromatic wheel of radius and degree . To prove the claim we use (an inner) induction on . The case is trivial if we use the outer induction hypothesis. Suppose the result holds for , that is, exists. Now by the inner hypothesis any block of integers of length contains either a monochromatic AP of length (in which case we are done) or a strongly polychromatic wheel of radius and degree . In the second case let which exists by the outer hypothesis, color the first integers and consider consecutive blocks of length . Since there are colorings of each block, by the outer hypothesis there must be an AP of identically colored blocks: . Now as so inside each block, there is either a monochromatic AP of length in it, (which proves the theorem) or a strongly polychromatic wheel of radius and degree . Ruling out the former case means that each block contains a strongly polychromatic wheel of degree . Since these blocks are identical in color so we have a AP of strongly polychromatic identical wheels. In this case, by lemma 1, the AP of blocks contains a weakly polychromatic wheel of radius and degree . By lemma 2, is either strongly polychromatic or contains a monochromatic AP of length k. In either case we have proved our claim. The proof of van der Waerden’s theorem is trivial now. Choose . Now an -coloring of contains either a monochromatic AP of length or a strongly polychromatic wheel of degree . The latter case is not possible due to lemma 3.